The fuel system on the vehicle engine is divided into two types, carburetor type and fuel injection type. Both types have the same function to supply gasoline into the intake manifold with ideal volume. But does it have a cooperative principle? Obviously different, the carburetor type uses the principle of pressure difference while the type of fuel injection uses the principle of computerized calculation. Then how does a fuel injection work? let's discuss in detail. Fuel injection system is a mechatronic circuits that combine mechanical and electronic circuits to achieve a common goal, that is to supply fuel to the intake manifold with ideal volume. There are two groups in the fuel injection system, namely fuel lines group (mechanical parts) and controller group (electronic parts). The injection system is used in almost all vehicles produced today. 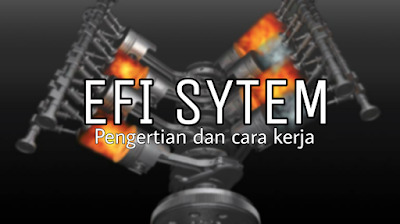 This is because the injection system has many advantages. All the advantages above are obtained because the fuel injection system uses a working principle that is very different from the of carburetor type. In addition, there is also more reference in determining the volume of fuel supplied, so that it can be more accurate. Fuel injection system and carburetor using same principle, that is the difference of pressure. However fuel injection system, the pressure on the fuel side is increased so that it is larger than the intake manifold space. So that it can be said, in the type of carburetor the pressure inside the intake space (venturi) is lowered so that there is a pressure difference. While in the injection system, pressure on the fuel side is increased so that there is a pressure difference. To increase the pressure on the fuel side, there is an electric pump that will pump the fuel to the fuel hoses. Because the pressure from the fuel side is greater than the intake, the fuel will come out to the intake manifold through the injector. The snippets above are only cover descriptions, for further details please continue reading. Fuel tanks, components for storing fuel stock. Fuel pump, the function is to increases fuel pressure in fuel hoses. Fuel hoses, the function is to drain fuel from the tank to the injector. The system controller, adjusts when and how long the injector opens. When we start the engine, the fuel pump will work so that the pressure fuel in the fuel hoses increases. Here, there is a flow of fuel from the tank to the fuel pump and towards the injector. In this condition, the pressure in the fuel lines is greater than the pressure on the intake maniflold so that when the injector is opened, the fuel can exit immediately. However, the injector does not open carelessly. But there is a calculation done by the ECU-Sensor-Actuator to regulate the volume of fuel needed. We call it an electronic controller because the fuel injection system has more electronic parts than mechanical parts. For mechanical parts, only limited to above. Then, how does this electronic controller work? IAT (intake air temperature), used to detect intake air temperature. MAF (mass air flow), used to detect air period based on its flow. MAP (manifold absolute pressure), used to detect vacuum in the intake manifold. Oxygen sensor, used to detect the level of oxygen in the exhaust gasses. CKP (crankshaft position), used to detect engine RPM. CMP (camshaft position), used to detect TOP 1 engine position. ECU or electronic control unit is a processor on a vehicle that functions to calculate all data from the sensor. So, ECU functions to process data, the result is a command given to the actuator. While the actuator is an output device that functions to translate commands from the ECU into mechanical movements. In this case, the injector functions as an actuator. The injector receives a command in the form of voltage from the ECU and then changes it into a motion to open the noozle at the end of the injector. When the noozle is openned, the fuel can out immediately. Then what is the scheme ? When we start the engine, the crankshaft automatically rotates. That causes the suction process on the piston to occur, so the injection system sensors will work to detect temperature, mass, vacuum, and engine temperature. All data is sent to ECU in the form of voltage with a certain value. ECU will process all the data from the sensor to determine the ideal volume of fuel in the engine condition, the result is the final voltage sent to the injector. The injector is made of a tube with a noozle. The noozle has a function as a door, in default, the noozle will be closed. But when there is a final voltage from the ECU, the noozle will open. This noozle can be open and closed, because there is a solenoid. Solenoid is a component to convert electrical energy into motion energy. The way it works uses electromagnetic forces. When there is a voltage from the ECU, there will be magnetism in the solenoid which will move the iron core in the middle of the solenoid. The iron core will attract the noozle so that it opens. The openning of noozle will spray some fuel from fuel lines to the intake maifold with ideal volume.